Cabling and bracing systems are used to provide supplemental support to leaders, individual branches, and/or entire trees. When a tree has a structural defect or condition that can not be corrected by pruning alone,and poses a high risk of failure, a supplemental support system can often reduce this risk. Trees that have two or more main trunks are often prone to failure when under a stress such as a high wind event or excessive snow load. When two or more stems grow up along side of each other the distribution of limbs along each of the stems is out of balance and gravity naturally wants to pull the various stems in opposite directions. this Problem is often compounded by the defect of included bark between the stems. Included bark between trunks will over time create an outward pressure as the tree grows, pushing the two stems apart from each other. There is no knitting together of wood fiber to create a strong joint, as will happen with most normal branch unions. Cables restrict the distance that branches can move in relation to each other. They also help opposing stem to support and balance each other. Installed across a weak crotch, they will greatly reduce the risk of failure. The proper installation of a support cable or bracing require solid arboricultural and engineering skills. The Forest Keepers are equipped and ready to help you give your valuable trees the support they need. 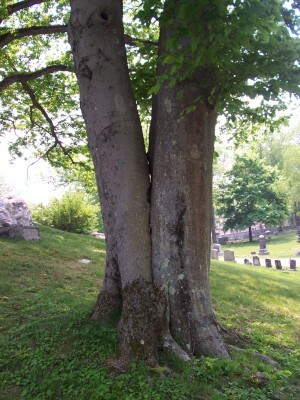 You can see the area where these two Beech trunks meet are not actually connected. There is certainly included bark in between these two stems.